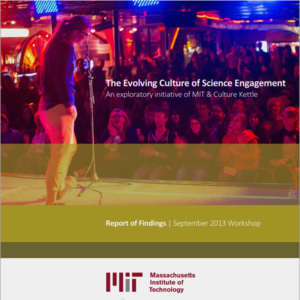 When I attended the Evolving Culture of Science Engagement workshop last fall, I was truly inspired by all the talent, technology and pure chutzpa being funneled into creative efforts to engage broader audiences in science. I’m based at the Norman Lear Center, a think tank at the University of Southern California which is devoted to understanding how the power of media, entertainment and storytelling can be used to educate citizens and elevate civic discourse. And so, of course, I love the idea of using rap music, comic books, stand-up comedy – anything that’ll grab and hold attention – to get people hooked on science. And I love it not only because I think it’s fun. I also know it works. Our research has demonstrated again and again that great storytelling is an incredibly effective way to educate broad audiences about things they thought were boring. That’s one reason that we’ve partnered with the Centers for Disease Control and Prevention for over a decade to improve the accuracy of health information in entertainment TV programming: it turns out, a majority of Americans already believe that information is accurate and a quarter say that entertainment TV shows are a primary source for health information for them. Obviously, great storytelling not only reflects the world, it helps shape it. Potentially, a handful of carefully selected case studies could help answer some of these questions and provide us with some much-needed benchmarks for future research. It would be terrific if at least one of those case studies included the collection of engagement metrics from a digital platform, combined with a targeted survey instrument like the one we use to evaluate the impact of documentary and feature films. This research method would enable us to find out quite a lot about patterns of online engagement and how they’re related to knowledge, interest levels and behavior change in a target audience. In order for this initiative to succeed, and to attract the funding that will fuel it, I believe we need to answer hard questions like this. But I have a sneaking suspicion that this incredibly clever and committed group of people will not only tackle this challenge but figure out what works pretty darn quick.